Migration is the focus of intense political debate across the OECD. These debates increasingly generate smoke and heat, but precious little light for the evidence or focus on the substantive questions that demand answers. A better understanding of the economics of migration, its social impact and the associated political dynamics is urgently needed. This is the subject of our recent report, co-authored with Andrew Pitt and Kathleen Boyle (Goldin et al. 2018). We explore the economic impact of migration on aggregate and per capita incomes, as well as their distribution. Without migration the OECD would have seen slower rates of post-crisis growth, among economies that would have also been smaller initially. We provide fresh evidence on the factors that shape the widening disconnect between political discourse and the level and impact of migration. The tide of anti-immigration sentiment is already associated with a reduction in migration. Weaker growth performance and a more competitive global environment for migrants risk compounding these effects. This is likely to result in lower growth trajectories, with important associated fiscal and social risks. To prevent this, societies will have to do more to better spread the benefits of migration across incomes, regions, and in the management of public services. We estimate around two-thirds of US growth between 2011 and 2016 is attributable to the labour supply effects of migration. In the UK, if immigration had been frozen in 1990, we estimate the economy would be 9% smaller than it is now on the same basis, equivalent to a real GDP loss of over £175 billion (in 2016 prices). In Germany, if immigration had been frozen in 1990, the equivalent net economic loss would be 6% or over €155 billion (in 2010 prices). Source: Goldin et al. (2018). These figures are likely underestimates. They only include the direct labour supply effects of migration, and miss wider, long-term benefits. Two of these stand out. First, there is evidence that migration (particularly low-skilled migration) supports greater female labour supply. Among less-skilled women, this is associated with greater rates of participation; among higher-skilled women, this is associated with greater participation intensity (hours worked). The latter effect often has a greater impact in terms of aggregate labour supply and is more closely associated with lower skilled migration. Second, migration has made substantial, persistent contributions to innovation. The micro-evidence of migration’s disproportionate impact has long been known. Migrants are twice to three times more likely to start a firm, to lead a firm to ‘unicorn’ status (raising over $ 1billion in funding), to receive a Nobel or Academy Award, or to issue a patent than the native populations in the US and UK. 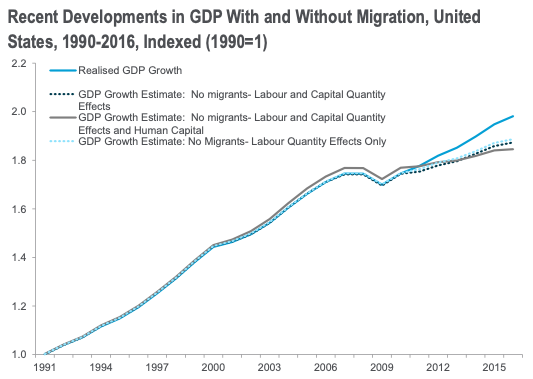 Now, however, a quantifiable causal migrant contribution to aggregate productivity growth is emerging. Higher productivity growth can both drive migration and reflect it. We have overcome this endogeneity challenge econometrically and identified strong positive effects, corroborating the microeconomic and policy-based evidence that suggests policies designed to promote skilled migration can be successful innovation policy tools. For productivity, skill level matters. Unskilled and semi-skilled migrants can both drive productivity benefits, but these are more consistently associated with high skilled migration. The latter has been an integral part of virtuous circles in many global cities and, subsequently, economies. World-leading innovation has become increasingly focused on regional economic clusters. Migrants are essential to the success of these dynamic regional centres. Firstly, migrants often play a disproportionate and central role in the breakthrough innovations that have set regional economies up for innovative leadership.The higher up the skill or ‘success’ distribution, the more disproportionate the contribution of migrants becomes – be it in academic innovation, entrepreneurship, or innovative business leadership or otherwise. Such innovations often form the basis of innovative clusters. The willingness of migrants to move has fuelled the subsequent outperformance of these regions. The global market for skilled migration is highly integrated, with highly productive migrants drawn more extensively to where the rewards are greatest. This leads innovative migrants to move to the most dynamic centres, building networks which further facilitate access to global ideas and talent. Migrants contribute to both the production and adoption and adaptation of innovations. As migrants drive the growth of such clusters, growth then attracts more migrants – bringing with them more innovative skills, international linkages, and additional benefits associated with diversity. The willingness of migrants to move into these areas drives further growth, kickstarting the process all over again. Globally, it is then no accident that the most dynamic cities are typically characterised by high shares of migrants (with Melbourne, Toronto, and Vancouver at over 40%, London around 35%, and Dubai 95%). Skilled migration is heavily concentrated in a handful of cities within a small number of preferred ‘destination’ economies. For example, the US alone has historically hosted close to half of all high-skilled migrants to the OECD and one-third of high-skilled migrants worldwide in 2010. The idea that high levels of migration are inherently not tolerated by societies is not borne out by the evidence, as these cities can often be the most tolerant. These observations help explain one reason why this might be, as these cities are enjoying the direct benefits of migration. When combined with differences in values, this is driving diverging attitudes. Not only will cities such as London and New York stand to lose if policy disrupts migration growth contributions, but the negative spillovers will be felt across entire economies within which these cities are situated. This is especially true as productivity growth has often become more regionally concentrated in these economies, with these regional clusters driving a higher portion of aggregate productivity growth. Note: Data on high-skilled migrants by Public Use Micro Areas in 2010 are drawn from the 5-year sample of the American Community Survey. These data are subsequently merged to 1990 Commuting Zones using the crosswalk files and weights developed by David Dorn (http://www.ddorn.net/data.htm). High-skilled migrants are defined as those with at least one year of tertiary education. 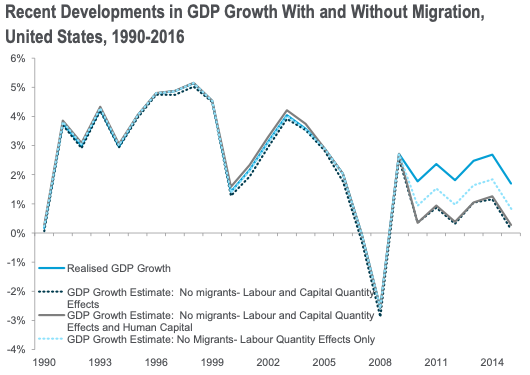 The impact of migrants on the dynamics of growth and productivity are rarely recognised in economic analysis, let alone political or other discussions. These significantly underestimate the contribution of migrants to the dynamism of societies and the negative potential impact of blanket protections, especially as damage to these virtuous dynamics would likely prove permanent. A key finding to emerge from our research is that the benefits accruing to dynamic cities from migration need to be more widely shared if negative perceptions regarding migration are to be reversed and policy risks reduced. Migration has propelled the most productive regions forward, but these benefits have not been widely diffused. The result has been widening regional disparities. It is hard to make the case for the virtues of migration to an ex-industrial worker in Wisconsin on the basis of benefits accrued to Silicon Valley – or of the benefits to dynamic cities such as London to people who cannot afford to live in them. This is central to the contemporary political challenges of migration. Stagnating incomes and opportunities, which have been compounded by the financial crisis and technological disruption(Nolan et al. 2017), have been associated with rising income and wealth inequality. Resentment with the elites who live in dynamic cities and frustrations arising from an inability to benefit from the changes has been channelled by politicians and parts of the media. These groups have often also been eager to establish their value-based nationalist credentials, appealing on new bases to voters in an attempt to pull support away from mainstream parties. A recognition that migrants are not necessarily always beneficial to all groups in society is also needed to pull the debate away from such political forces. As is the case with a number of other disruptive trends, such as trade reform, aggregate benefits are not synonymous with paretoimprovements. There are particular groups of workers or locations that require either protection or compensatory policies. This is similar to the trade reform analysis, where trade adjustment measures are an appropriate response to ease the burden on particular groups. Our work identifies that while significantly beneficial for the society as a whole, and overall levels of income and growth, migration has disadvantaged certain social subgroups and occupations, particularly with low skill levels. Migrants in a number of economies have been substitutes for lower skilled people and complements for the higher skilled. This results in aggregate benefits being skewed towards higher earners. It is worth noting that, in many cases, those most easily substituted for migrants are other recent migrants themselves – an observation that has been borne out in the UK’s recent experience. In contrast to the UK’s Migration Advisory Committee’s policy recommendations (Migration Advisory Committee 2018), however, we find that the problem for these native workers is less from low-skilled migrants (for whom substitutability remains relatively low) but instead from migrants with higher skill levels than the lower-skilled natives, who are working in occupations for which they are overqualified. Inequality augmenting outcomes have often been driven by poor skill recognition, and the subsequent push of labour competition disproportionately onto the narrower shoulders of lower-skilled workers. Improvements in migrant skills recognition, which allows them to use their skills and be employed in higher skilled jobs, in our view is likely to lead to improved incomes for low-skilled native workers, better outcomes for migrants, and better aggregate economic performance. We show that a substantial part of the migrant wage penalty in many cases is the result of differential access to higher paying occupations (even after having controlled for education). Better skills recognition, and subsequent access, would, in many cases, generate widespread benefits. 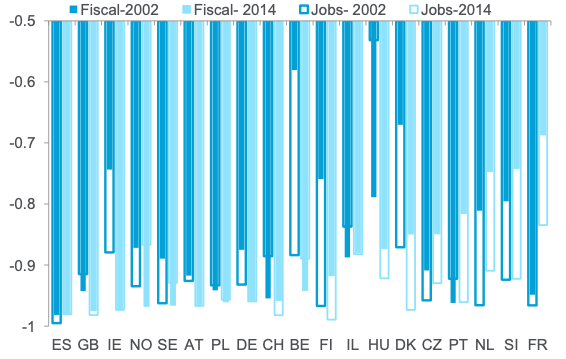 The effectiveness of different active labour market policies in Germany, for example, can point to a way forward. Here, policies that help overcome informational barriers, such as private work placements, yield particularly extensive benefits among migrants. The contemporary politics of migration poses real economic risks. 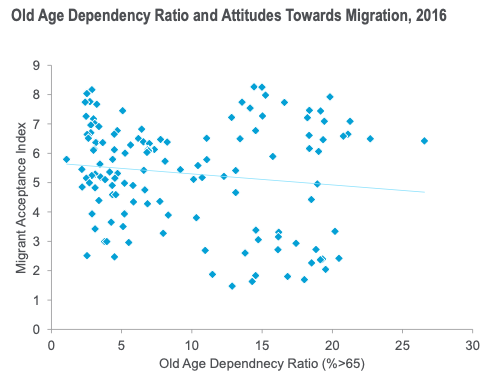 As societies age, the contributions of immigrants will become even more critical. Immigrants typically are educated elsewhere and leave before retirement. As they are disproportionately of working age, they pay more in tax than they take out in benefits, with the net benefits being even more evident when this is evaluated comprehensively. With public sector debt burdens already high, and productivity growth falling, errors in fiscal policy have the capacity to be costly. Recent political developments make this increasingly possible and could result in dramatic increases in government debt. 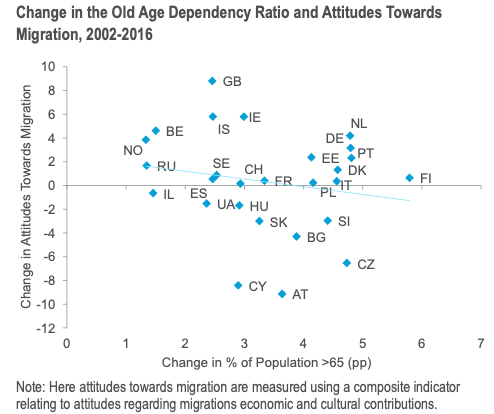 Changes in attitudes towards migration are disconnected from economics. There are no obvious relationships, for example, between changes in public attitudes towards migrants, and those countries that, economically, may have an interest in accepting migrants. Misconceptions around migration abound. Migration is thought to be both more extensive, and less productive, than in reality (Alesina et al.2018). Across the US, UK, and Germany, rates of unemployment among migrants is thought to be roughly five times the level that it is, and the proportion that are low earners almost double the reality. 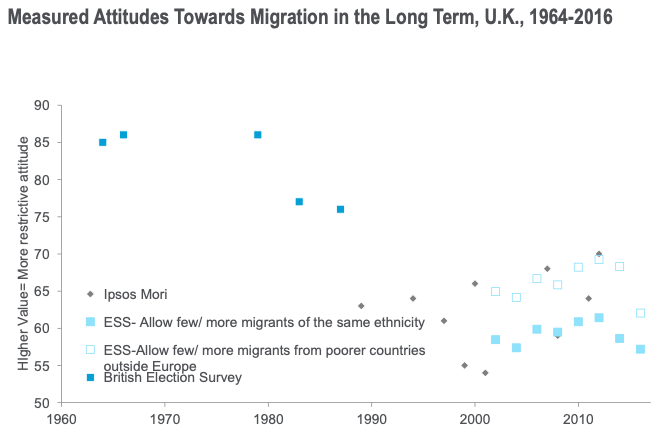 Attitudes towards migration have changed somewhat in recent years, though such changes have often been concentrated among specific subgroups, rather than aggregates. Attitudes towards migration can be distilled down to two sets of factors. First is solidarity. This changes slowly, and characterises the degree to which people self-identify and empathise with others of different nationalities. Second are perceptions of aggregate scarcity, and the degree to which key economic resources, such as public services and jobs, are seen as under pressure. We find that there is a close association between perceived migrant impacts on such resources (jobs and public resources) and attitudes towards migration. Correcting what we show to be misperceptions is important. Evidence from Japan does suggest such schemes can yield support for more accommodative policies. Notes: ‘Fiscal’ refers to the perceived net contribution of migrants to an economies fiscal balance (net contributors or otherwise). Attitudes regarding the perceived impact of migration on jobs are derived from answers to the question of whether migrants take jobs away from natives. Attitudes towards migration are measured using views on whether the respondent favors more restrictive migration policy towards migration from all sources. However, this misses crucial endogeneity behind the perception of migrations’ fiscal and employment consequences, and wider perceptions around economic scarcity. For example, it has been shown that public service pressures have a common (adverse) impact on support for migration across all cohorts. When resources are scarce, ‘fixed quantity’ fallacies become more acute. Anti-migrant attitudes are typically greatest when concerns about scarcity complement nationally defined limits of solidarity. Education levels have often played a particularly important role here, with lower education levels being associated with the recent experience of income stagnation, and economic scarcity, as well as more nationalistic attitudes and perspectives. Austerity, in particular, may have also had a significant impact here, especially when it has fallen on poorer communities. Migration’s newfound political centrality is the outcome of new forms of political competition rather than any changes in individual attitudes around it. ‘Political entrepreneurs’ have, in recent decades, been building coalitions on the basis of orthogonal, value based, issues. These groups have often received a notable boost since the crisis, with growth in anti-elite attitudes. By fusing culturally conservative and anti-elite messages, these groups have often managed to boost their support. These political developments are reaching a critical point in their effect on wider political competition. Traditionalstructures of part political competition have been eroding for some time. These political forces are driving this disruption, and immigration is the central policy issue being used to drive disruption and instability. This risks more than disruption to migration policy alone. Notes: British Election Studies 1964, 1966, 1979, 2015, the question asked was: Do you think that too many immigrants have been let into this country or not? The data graphed above is the % who answered yes. 1983, 1987, the question asked was: Do you think that immigration has gone too far? The data graphed above is the % who answered yes. 1989-2017 data are from Ipsos-MORI. The question asked was: How much do you agree or disagree with the following statement? “There are too many immigrants in Britain” 5-point scale from ‘strongly agree’ to ‘strongly disagree’. ESS data includes two questions depending on the origin of the migrant. Average response of 5 point scale answer reported, normalized to 100. Each change in legislation is scored by whether it is 1) more or less permissive and 2) how extensive the change is. The concerns of citizens need to be listened to and the real underlying concerns regarding stagnating incomes and opportunities addressed by our political and business leaders. Our work shows that the economic impact of migration depends almost entirely on the policies that are put in place to ensure that migrants are able to be productive and the extent to which individuals and communities experience the benefits associated with migration. Currently, cross-national attitudes towards migration bear little resemblance to the economic necessitates, but instead the power of perceived economic and cultural threat. Countries that are most in need of migration due to collapsing fertility and tight labour markets (such as Poland) are often most against it. Recent changes in both attitudes and migration’s political debate have been heavily influenced by the stitching together of a new cultural and values-based discourse by politicians. These pose real economic risks; the race to the bottom by politicians to show how tough they are on immigration could cause substantial aggregate damage. 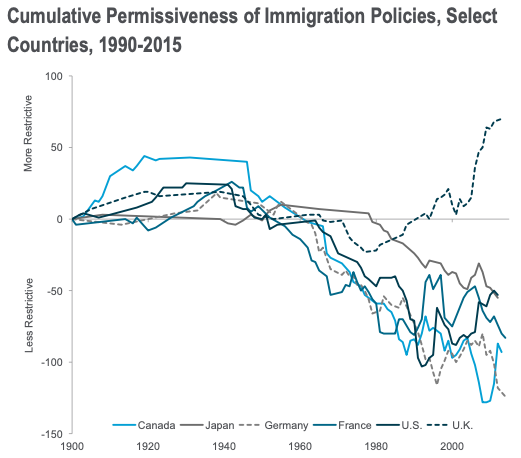 Alesina, A, A Miano, and S Stantcheva (2018), “Immigration and Redistribution”, NBER Working Paper No. 24733. Goldin, I, A Pitt, B Nabarro, and K Boyle (2018), Migration and the Economy: Economic Realities, Social Impacts & Political Choices, Citi and Oxford Martin report. Migration Advisory Committee (2018), EEA Migration to the UK: Final Report, September. 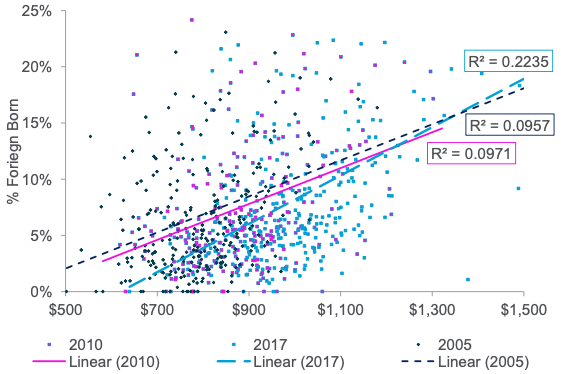 Nolan, B, E Rahbari, M Richiardi, L V Rivera, and B Nabarro (2017), “Inequality and Prosperity in the Industrialized World: Addressing a Growing Challenge”, Citi Velocity Report, September. We argue policies towards refugees should be driven by humanitarian and ethical considerations, and require more burden sharing, and economic migrants which should be informed by economic considerations.